Welcome in the Alpilles, just a step away from Vaucluse, between the Camargue and the Luberon !!! You are nature lovers and fond of quad-bikes, we propose some quad-bike rides accessible to anyone. Our tours are guided and we’ll show you our stunning area while having fun and enjoying riding Quad-bikes. With specialists, various itineraries, very little tarmac, incredible sites to discover, material and equipment renewed each year and daily maintained and checked. Our motto : respect the environment and have fun !!! We can provide 20 quad-bike customers (for more, please contact us) but we go on rides with you from 2 quad-bikes. 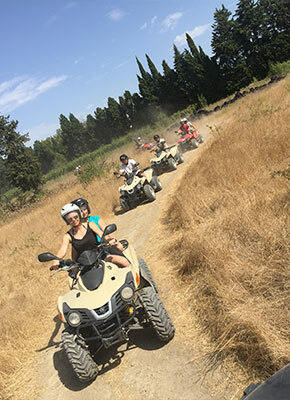 Our rides are always organized in small groups, never more than 8 quad-bikes (except special request). The car driving licence is necessary for the drivers and passengers must be over 6 years-old . If passengers hold a car driving licence they can also drive the quad-bikes. For each ride, we start with a training session on an adapted route.This short session enables you to feel confident to ride a quad-bike for a longer tour.Whatever happens, our guides always adapt the speed of the rides to the abilities of the drivers. You’ll enjoy a tailor-made supervision. Type of rides: various landscapes, small roads, trails, country roads and paths. According to your mood and your level, we can propose you some technical ways and a few breaks to give you explanations about the local history, and culture as well as environmental aspects of our area. Wine tasting, site visits, and discovery of the landscapes as well as sensation will be part of the ride. Whether you are on your own or coming with your company, celebrating a birthday, a bachelor party, or organizing a challenge or simply for fun, join us to discover the valley of Les Baux de Provence and its various sites full of history. (Planning of departures according to reservations). We receive you in a warm and friendly atmosphere to share a unique moment full of fun, sensations and relaxing. Several packages are available: 1h, 2h, 3h, 1/2 day or full day. Private individuals, groups or works councils (reservation advised). : From June to September, night rides from 19.30 to 23.30 with dinner at the restaurant. RATE: 120 €/driver and 60 €/passenger all included (only on reservation)We also propose to organize multi-activity days for groups or seminars Quad-bike rides,bicycle rides, horse-drawn carriage rides, Paint-ball, Safari 4×4 etc … as well as meals. Free quotation upon request at : 04.90.15.40.47 . From 4 quad-bikes and if an itineray can be adapted we can organize a ride directly from your hotel or your rented accommodation. In this case we’ll come to your places with our quad-bikes (a spotting day can be necessary). 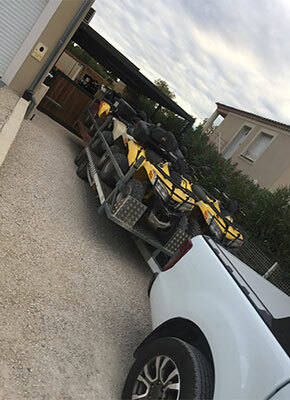 Provence Quad Rental provides you with Quad-bikes for 2 people 300 CC (alone or with a passenger). According to the law , all our Quad-bikes are probated, registered and insured (for the rental). Not very noisy, they are equipped with transportation catalytic converter and with a four-stroke engine (flexible) with a dimmer, without gears, which enables the driving. You’ll also enjoy the stability of its 4-wheel drive, low pressure, for a comfortable and an exceptional roadholding.